Highly configurable (can even be configured/used for sites that have more than one shop/site using the same database). Test Mode Available so you can send review emails to yourself before you send them to real customers. 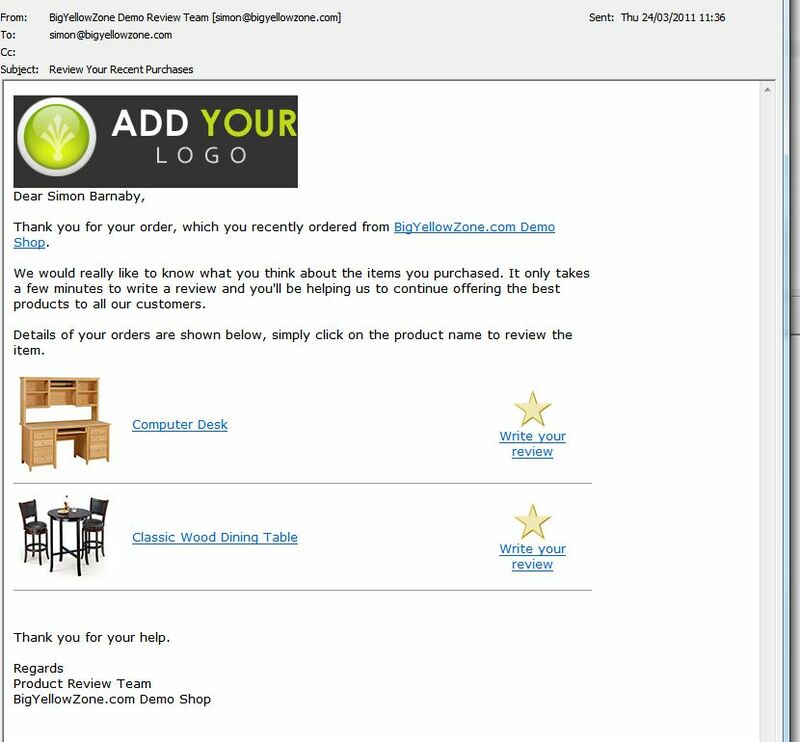 Won't email the same customer more than once for the same orders (automatic "flag" setting applied for you when you send live emails; it stamps the date/time that the review email was sent on the relevant orders). 02 16-APR-2011 Fixed bug that was causing errors when blank dates were being used for order date search parameters. Corrected the CASE sql syntax for MySQL in the Order query. Changed the within date sql to return y or n instead of 1 or 0 (as 1/0 were being treated differently on some database types, eg as bit on some and as numbers on others, which was causing a mis-match). Took out a spurious condition for Fail in the ocardtype for the order query (should have only been using the byz_xconfig_erv_order_inclusion_conditions_default config option instead). Added extra catch to make sure that customers with null email addresses arent queried. Added more help on the usage notes about how to configure the byz_xconfig_erv_order_inclusion_conditions_default option. 03 09-JUN-2011 Added extra config option (byz_xconfig_erv_extra_customer_columns) so that you can optionally take across additional customers columns to the send-email function (and/or to get displayed on the screen where relevant). This is used, for example, if you want to target different emails to different countries. 04 18-AUG-2011 Added an additional correction to the sql statement for when date parameters are blank.